Over Labor Day weekend Brit and I decided to try making a super bubble wand. This idea came from this video of Sterling “The Bubblesmith” Johnson. We went to the Chief Lookings’ Village park in Bismarck which overlooks the Missouri river. The park is very open and has a large hill that slopes down to the river. 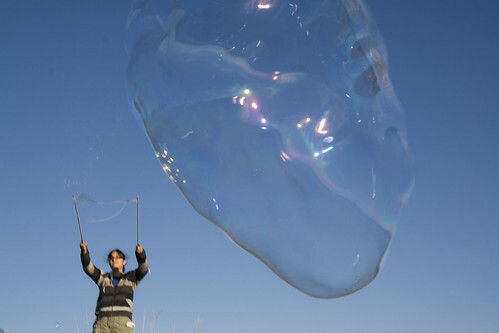 There was a nice breeze, perfect for making super bubbles. We started off with a clothesline rope that seemed more absorbent, which I thought would help. It didn’t work very well. Next, we tried simple cotton string. After running the twists out, it worked perfectly. It took a few minutes to get used to opening and closing the wand, but after we got the hang of it we were in business. We did at times have a 12 foot “bubble tube” running from tip to wand. We also got some watermelon sized bubbles to float a good 20 yards or so over the edge of the hill, and smaller ones well over 100 yards. The wind got a little bit too strong and uneven to get some of those really large bubble tubes to actually release and stay in one piece for very long. While we were blowing the bubbles we had a few vehicles pull up and just hang out for a few minutes watching the show. I said we were just so popular it was because everyone was calling their friends. lol. Here’s some other photos of our adventure! Here are the links to everything I found to make the wand and bubble solution. Enjoy trying this out for yourself.